Website will provide information for people to find registered, competent electricians in their area. A new website launched today will provide an easy to use and single information point for people to find a registered, competent electrician in their area, or to check that a company they are planning on using is registered. Similar to the ‘Gas Safe Register’ for boiler engineers the ‘Competent Person Electrical Register’ lists electricians who meet core technical standards required by government. The www.electricalcompetentperson.co.uk website is being unveiled today by Minister for Communities Stephen Williams and has been developed by electrical competent person scheme operators with support from the government. For all the thousands of skilled and reliable electricians there are across the country it’s often the dangerous or dishonest actions of a small minority of rogue electricians that get the attention. I want everyone to be able to get repair and improvement work done safely in their home and this new, single website provides an easy first port of call to find a registered, trustworthy local electrician. All registered electrical firms in England and Wales are listed on this new website and entitled to use the new registered competent person electrical logo on their vans, websites and promotional material. Electricians are assessed for their competence before they are registered and are subject to periodic random surveillance to check that their work meets safety and quality standards. Across England and Wales there are 42,000 registered electricians. 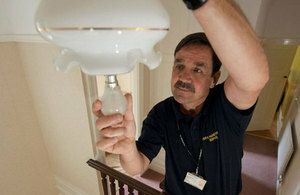 Standards of electrical safety in homes are rising both through improved products and raised standards for electricians. The annual number of electric shock and electrical fire fatalities has fallen from around 90 in the mid 1990s to 55 now. Choosing someone to carry out work in your home is a decision that should never be taken lightly. Consumers now have just one name and one easily recognisable mark to remember and they can be reassured that everyone listed on the site has had a sample of their work checked and assessed in accordance with the required electrical standards. The creation of this site and mark are evidence of the strides being taken by the industry to come together for the greater good. It is not only an added benefit for consumers but also a mark that registered electrical firms can be proud to be associated with. All Full Scope installers carrying out electrical work in dwellings in England and Wales can be easily identified via the new mark and their company details listed on the user-friendly register. Before January 2005 there were no restrictions on who did electrical work in people’s homes or how it should be done. The Department for Communities and Local Government (DCLG) authorises bodies to operate schemes under which their members are deemed competent to self-certify that their work complies with the building regulations for England. A similar scheme is authorised by the Welsh government. All Competent Person Scheme Operators are required to meet DCLG’s conditions of authorisation for work undertaken in England and the Welsh government applies identical conditions in Wales. These include requirements on the technical competence and safeguards for customers.